I recently travelled to Addis Ababa, Ethiopia where I had been invited by the US Department of State, to participate in the thematic exchange workshop on Access to Energy for All, under the International Alumni Thematic International Exchange Seminars program of the United States Bureau of Education. The workshop brought together up to 17 alumni from various US Government Exchange Programs who are working in the energy sector from both public and private organizations on the African continent. Represented countries included Uganda, South Africa, Zambia, Malawi, Nigeria, Ghana, Ethiopia, Kenya, Tanzania, and Rwanda. The purpose of this workshop was to further generate ideas, solutions, and share experiences of how to fill the energy access gap on the African continent. It was also a networking opportunity for these actors across Africa to set up possible areas of collaboration on projects and areas of mutual interest across countries. The participants also had a chance of visiting a developing Waste to Energy Power Plant on the outskirts of Addis Ababa that is set to generate up to 50 Megawatts of electricity from the municipal landfill waste generated by the city Addis Ababa; as well as technology firm that manufactures smart and efficient electricity meters and monitoring systems. 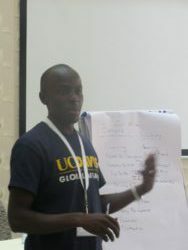 In this workshop, I had an opportunity to lead and facilitate a session on Energy Markets and Business Entrepreneurship. My interest in this session was to stimulate a discussion with the participants on how we can catalyze the energy markets to make them more efficient enough to effectively meet the still underserved markets in Africa. All this based on my strong belief that market systems approaches are the most efficient and sustainable way of making sectors more efficient in delivering products and services to the people that need them. Even though the private sector approach has been on frontline for a long time, the pace of coverage is still low. And while massive efforts have been made to extend the grid to many communities, to generate more megawatts of electricity, and to design various ‘low cost’ energy products and services for the ‘poor’, energy poverty is still prevalent, and many households have still failed to connect to the grid. As long as the end-use energy challenge is not addressed, grid extension alone does not achieve energy access. I believe one of the solutions that will give us milestones is an efficient energy market and high risk entrepreneurial approach where a fair balance is placed on both the demand side and supply side. A market based approach that is driven by favorable polices and incentives, businesses that go beyond just the so called ‘base of the pyramid’ and an energy infrastructure that is oriented towards end-use energy as a solution to energy access. End-use energy means a user being able to turn on a switch or plug in within their house and get light or power an appliance or a processor, not just having a grid passing over their roof, or having a solar power plant near their town that generates electricity that they actually cannot afford to use. Because of this, we need to ask ourselves whether the problem is not having enough electricity generated, or is it the ability of the user to connect, use and pay for this electricity. Another way we can help support the energy access market is leveraging linkage of energy access to other sectors. Energy is not the need itself, but rather, it is about what it can do and its applications. Energy powers cold refrigerators for preservation, powers maize mills for village farmers, powers appliances for information communication for remote areas, powers food processing facilities for value addition, powers health centers, powers factories and industries that provide jobs, powers schools for education, powers laboratories for study and research, and powers lighting appliances for extended business operations, and so it should be presented this way, more like as a service, and not just a product. The talk of financing for energy access is endless, especially end-user financing, but what are the barriers to this financing? Most of the communities that are still below the energy poverty line are those still outside the formal financial sector, they don’t have bank accounts, are not part of any formal financial scheme that can potentially link them to the opportunities only available in the formal financial sector. This means that they miss out on any end-user financing programs, and hence they need to be brought in. There is also need to understand that low cost energy solutions such as pico-solar products, cook stoves, and biogas will still remain relevant for initial market entry for new customers. 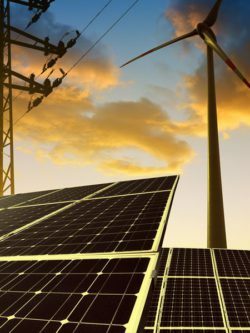 Gradually, they will move on to the next steps of the energy ladder to bigger and higher value energy technologies such as bigger solar systems and grid connection that enable users to do more in their homes and communities. Therefore these smaller low cost energy technologies should be totally ruled out as yet for newer adopters. The private sector needs to be supported with critical and impact investments and financing for high risk markets where innovative business models need to be introduced. Coupled with this, there is need to address market failures and their causes, by setting and enforcing standards of technologies and products across the market. The enabling environment: To further accelerate our efforts towards increased access to energy, there is need to ensure that the industry operates in an environment that enables it to perform efficiently without boundaries. This implies that the right policies have to be in place instituted by the respective governments and authorities, followed by the right regulations. Because of unfavorable or non-existent polices, new ventures and new investments cannot effective take place, for example policies and regulation that enable “net metering” to take place in some African countries. There is therefore need enact specific policies that will enable the flow of resources into the energy market, both on the supply side and the demand side, as well as on the regulatory side. From my role, as Terwilliger Fellow, working based out of Uganda is to rally and work with housing sector value chain actors to see that the market they operate in is more efficient enough to deliver affordable housing for all. This involves working with housing sector firms that cover areas of housing and construction, energy, water and sanitation, as well as actors that influence the housing market such as regulators and policy bodies such as government and industry associations.